The single most important thing you can do with you child this summer is engage them in reading. Not only is it crucial to read with them or have them read regularly to maintain their current fluency level, but the often relaxed atmosphere of summer break is a wonderful time to foster and encourage love of reading. Hectic school year schedules temporarily forgotten, no homework to fit in before bedtime, what better time to explore their reading interests and keep a ready supply of enjoyable reading material available. Turn off the computer, TV and game systems and send them out into the green, with a fresh fruit snack and blanket, to lose themselves in a wonderful book. Although we encourage our children to include non-fiction titles in their personal areas of interest, we primarily look at summer as a time for fun reading. The Greatest Food Fight Of All Time. Nothing says fun more than the freedom of a food fight! Whether at your school, camp or in your own kitchen while baking cookies, chances are you remember to unabashed joy of a single, brilliant food fight in your collection of childhood memories. 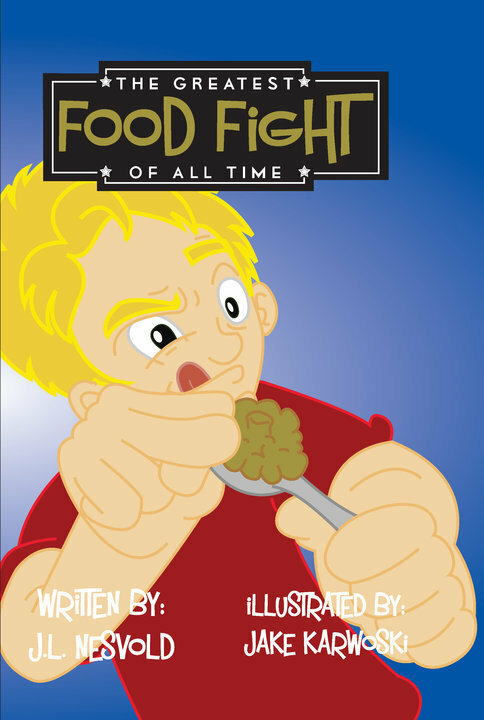 This is a read that you'll enjoy sharing with your child, as Jamie Nesvold walks us through the adventure of the ultimate food fight, with a humorous eye at all the steps along the way to the marvelously messy finale! Jamie Nesvold, a DJ in Fosston and father of four, says he has enjoyed writing "weird" things since high school and drew much inspiration for his book from his children, ages 6 to 16. My two older children make brief appearances in the book as supporting characters, and my son is the inspiration for the cover art and pictures of Tucker. It's a fun little book, I think, and Jake did a great job with the images. It's great for all ages. I truly enjoyed sharing this book with my son! Not only did it bring back fun memories from my childhood, but it was wonderful to see his eyes light up with glee as he imagined the food flying shenanigans! In between chuckles and big belly laughs: "You have to read this book!!!!" That's What She Said readers are invited to enter for a chance to win a copy of The Greatest Food Fight Of All Time, courtesy of author Jamie Nesvold! To be eligible to enter this giveaway, you must publicly follow That's What She Said via Google Friend Connect (left sidebar). This giveaway is open to residents of US & Canada, 18+ and will end on Saturday, July 30, 2011 at midnight, EST. The winner will be selected randomly from all eligible entries and notified by email. The winner will have 72 hours to respond before I must move on to a runner up. Please leave your email address, in anti spam format, in your first entry comment, if it is not available via your comment name, so i may contact you if you are the winner. For mandatory entry, please tell me in a comment your favorite food flinging memory, something crazy your kids have done or what your favorite food arsenal would consist of! * Like The Greatest Food Fight Of All Time &/or That's What She Said on Facebook. Leave a comment here with your Facebook name. 1 entry per each. * Follow That's What She Said (tsue1136) on Twitter. Leave comment with your Twitter name, 1 entry. * Share this giveaway! Just leave a link to your sharing in your comment. You can take 3 entries for each time you share with a direct link here! Blog it, post to Facebook, Stumble It, Technorati, Digg, post to a giveaway linky! * Subscribe to That's What She Said via email or RSS feed (left sidebar), 1 entry for each method. * Grab my Button for your blog (left sidebar) and leave a link in your comment so I can find it! 3 entries. Congrats to mverno, comment # 12, courtesy of Random.org! On behalf of author Jamie Nesvold and That's What She Said, thank you to all entrants for participating and following! Enjoy this blog? We would love a review from you, our cherished reader at Alexa! I received a copy of The Greatest Food Fight Of All Time to explore for the purposes of creating this feature. The opinions above are honest and my own. Images and information taken from various Jamie Nesvold sites and communications. Giveaway prize is provided and shipped by sponsor. Facebook is not responsible for nor involved in this giveaway in any fashion. I like the Greatest food fight on FB! when i was a teenager we had a birthday party for a friend at her house, a surprise party! beforf it was over there was a food fight with cake and ice cream going everywere.all in good fun of course? I remember getting sprite stains on my parents ceiling when i was a kit! Those lasted a while....oops! I follow you on GFC and my favorite memory is of my last day at a all week camp - we have a actual food fight, my one and only in my life - it was brilliant. It would have to include mashed potatoes!